On our recent visit to the Sabino Canyon Recreation Area within the Coronado National Forest, we took a tram to the trailhead for the Bear Canyon Trail. Our 2.6 mile linear hike through a riparian corridor surrounded by steep rock cliffs covered with desert vegetation culminated at Seven Falls. A steady trickle of water flowed over the rock formations landing in a pleasant pool and beach. After the hot trek several other hikers enjoyed the cool water. We hiked back out at a quick pace in order to catch a ride on the tram back to the visitor center and our car. Another great hike. A unique scientific laboratory can be found a few miles northeast of Tucson, Biosphere 2. The 40 acre campus houses the impressive 3.14 acre facility that has 6,500 windows with 7,200,00 cubic feet of sealed glass. The land was purchased for was purchased with private money in 1984 and the first team of eight, four men and four women, entered the structure on September 26, 1991 for a two year space colonization experiment. Later, Columbia University used the facility for a few years and now the University of Arizona is operating the facility with the help of some external funding. There are five biomes: ocean with coral reef, mangrove wetlands, tropical rainforest, savannah grassland, and fog desert. The basement houses 26 air handlers. A separate structure connected by a tunnel is the lung, which accepts additional air as the heat increases in Biosphere 2 during the day and returns air at night. 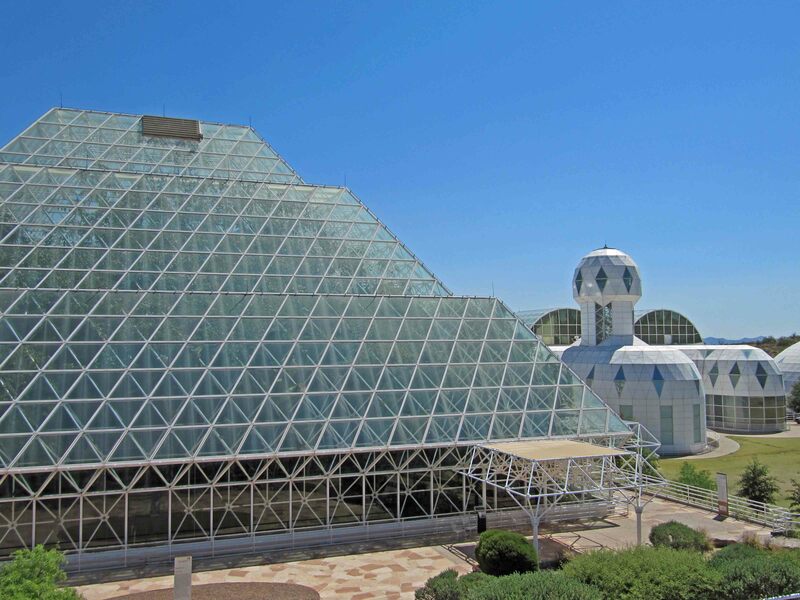 Biosphere 2 is an interesting experiment giving insight into life on earth. Let’s hope it’s not too late to make a difference in biosphere one. The saguaro cactus, an icon of the American West, is protected in the Saguaro National Park which was established in 1933. In addition to this giant cactus, the park protects and preserves a multitude of Sonoran Desert plants and wildlife. The 15-minute video, “Voices of a Desert,”shown at the Red Hills Visitor Center set a respectful tone for our visit. We learned that the saguaro flower only lasts 24 hours and produces as many as 2,000 seeds. During one saguaro’s lifetime, however, maybe no more than one seed will grow to maturity. 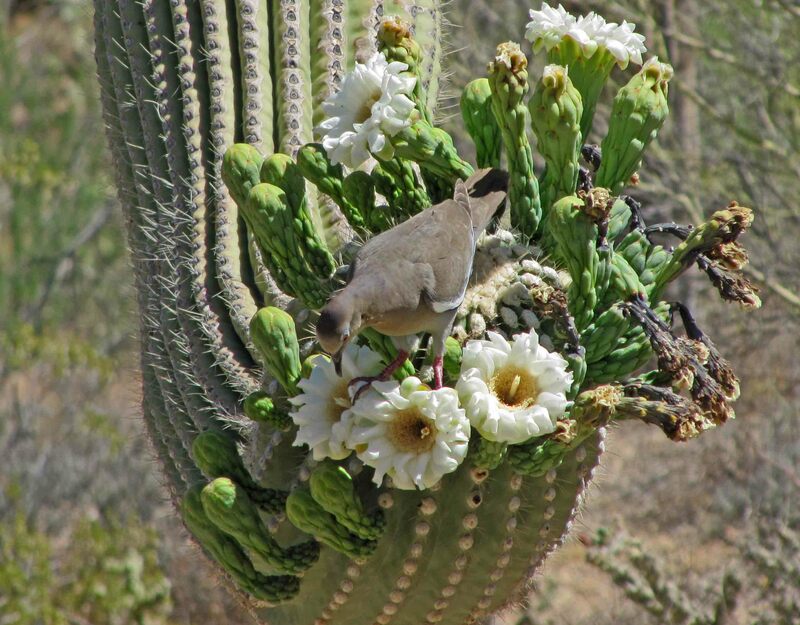 White winged doves were prevalent during our visit and taking advantage of the flowering saguaros. We watched one stick its beak deep into a saguaro flower as we started our half mile walk to the Valley View Overlook. This was one of several hikes off the five mile unpaved Bajada loop drive. We also walked the Desert Discovery Trail and the Cactus Garden Trail near the visitor center. The Saguaro National Park is a great place to see saguaro cacti, no two are alike. According to A Field Guide to the Plants of Arizona, more than 3,000 species of plants can be found in the state. 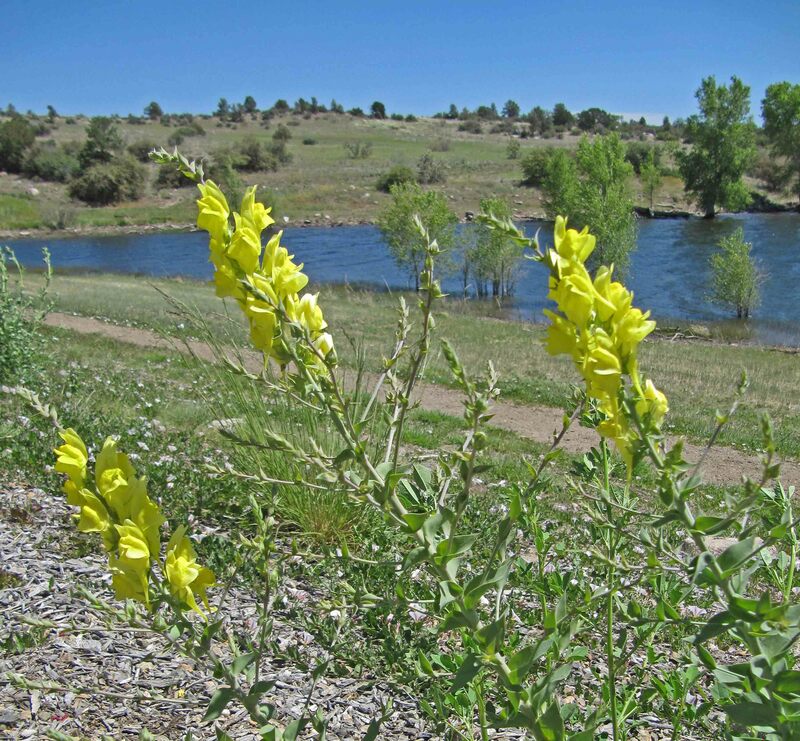 Our short walk around Watson Lake this past Saturday offered a pleasing view of wildflowers showing off their colors. Field bindweed, with its small white morning glory like blooms, covered the open fields. Stands of New Mexico thistle, with its distinctive pink-purple flowerheads, stood tall surrounding the non-boulder sides of Watson Lake. Examples of desert globemallow with its bright orange flower were spotted were and there. An open field hillside between the lake and the campground featured the bright red bracts of desert paintbrush. A few clusters of fleabane were in bloom on that same hillside. In the wooded riparian area of our walk, the distinctive lemon yellow flower of the yellow salsify was already in bloom. The fineleaf woolywhite, despite its name, has a distinctive bright yellow petalless flower. The winner of the most unusual name is “butter and eggs,” with a pale yellow snapdragon like appearance. This is just a sampling of the wildflowers now in bloom. Arizona wildflowers are a year-round delight. The Pueblo Grande Museum and Archaeology Park, located in a central area of Phoenix, preserves an important landmark of the Hohokam people. Starting with three acres donated by Thomas Armstrong in 1924, some 108 acres are now being preserved. The platform mound, probably a ceremonial and administrative center, was 300 feet long, 150 feet wide, and 25 feet high. At the southeast corner, a doorway faced northeast which at sunrise on the summer solstice and sunset on the winter solstice had a shaft of light which would stretch on the floor to another doorway thereby indicating the change in seasons. The mound, located along a major prehistoric (before whites) irrigation canal in the Salt River Valley, was constructed with some 720,00 cubic feet of fill. More than 40,000 people are estimated to have lived in the area and to have built 1,000 miles of irrigation canals. Phoenix claims the distinction of having the first city archaeologist. Archaeologists divide the history of the Hohokam into four periods: pioneer (450-750 A.D.), colonial (750-900), sedentary (900-1150), and classic (1150-1450). It is unknown what happened to this people after 1450. In addition to the preserved platform mound, the following re-creations can be viewed: pithouses from @950; an adobe compound from @1300; a ballcourt 82 feet long, 38 feet wide, with narrow openings at each end that was used @from 750-1200; a native garden. The museum provides an excellent overview of the life of the Hohokam people. 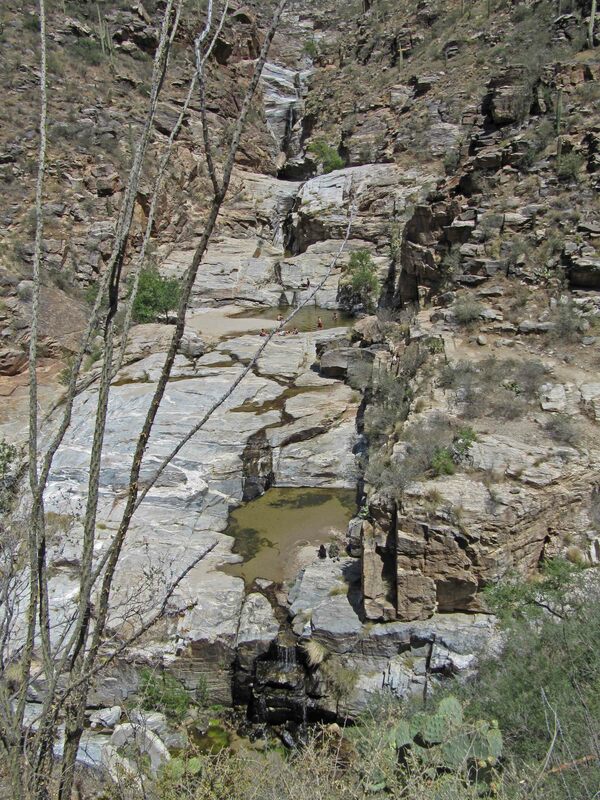 The changing exhibit, “Landscape Legacies: the Art and Archaeology of Perry Mesa” was of special interest because it pictures and describes the Aqua Fria National Monument, located on both sides of I17 between Black Canyon City and Cordes Junction. 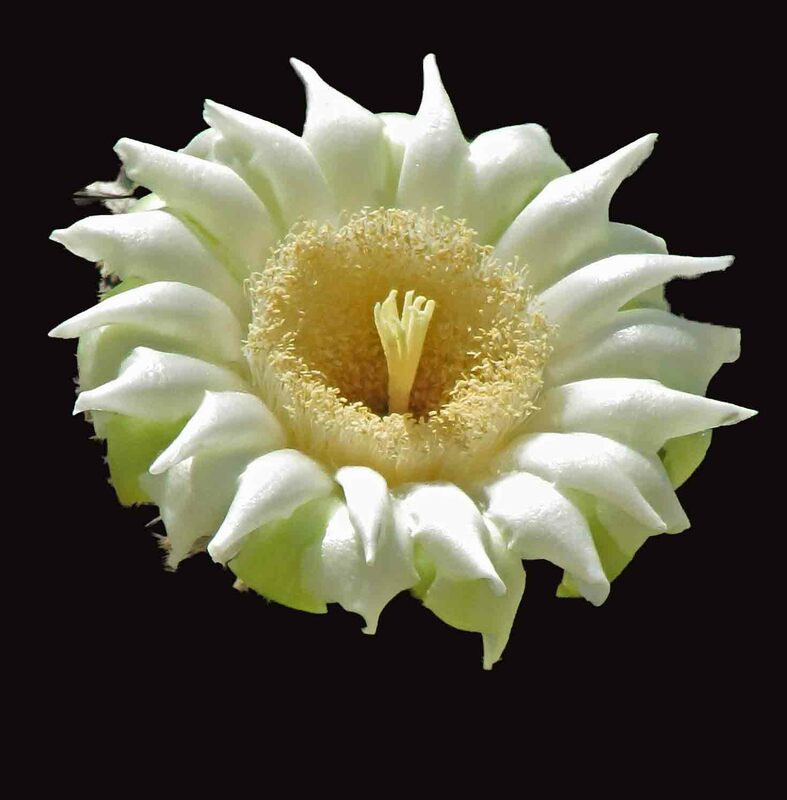 Saguaro are beginning to bloom, and my newly gained skill using Adobe Photoshop Elements’ magic extractor gives me the ability to display pictures of flowers in a new way. Rainbow Bridge, the world’s largest natural bridge, stretches 290 feet from its base to the top of its arch with a span of 275 feet. The top of the arch measures 42 feet thick and 33 feet wide. The Navajo, Hopi, Kaibab Paiute, San Juan Southern Paiute, and White Mesa Ute tribes consider Rainbow Bridge a sacred religious site. The Cummings-Douglas exploration group saw Rainbow Bridge on August 14, 1909. In May 1910 President William Howard Taft created Rainbow Bridge National Monument to preserve this “extraordinary natural bridge, having an arch which is in form and appearance much like a rainbow, and which … is of great scientific interest as an example of eccentric stream erosion.” To see Rainbow Bridge we took a 52 mile boat trip from the Wahweap Marina on Lake Powell. Some other interesting points of interest included Castle Rock, Romana Mesa, Crossing of the Fathers, and Gunsight Butte. 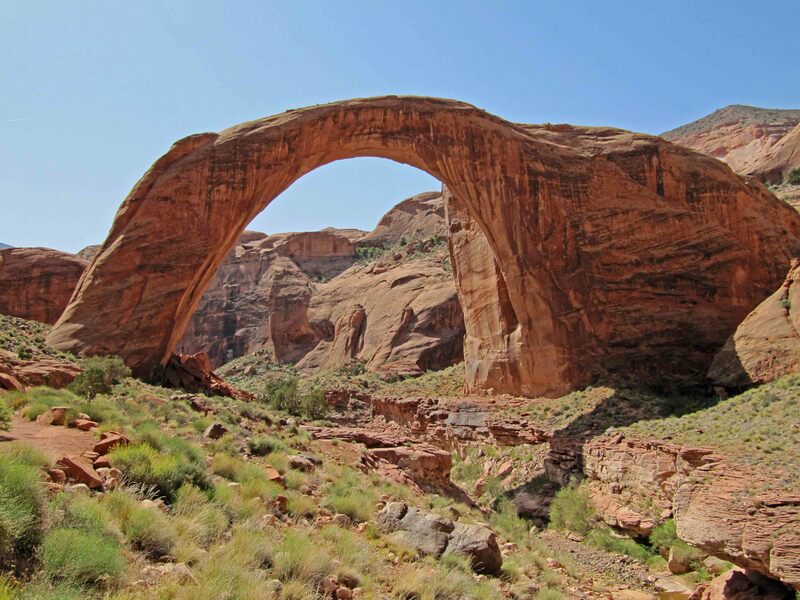 Rainbow Bridge, one of the world’s natural wonders, is in Utah northwest of Navajo Mountain, which still had snow.